Can I get Music 1 to separate songs by Females. I don't have many female songs in my library. With my last scheduler, I had create All-Female Categories and All-Male Categories to make sure I didn't get two gal singers in a row. Yes, Music 1 can assure that you'll have no 2 females back to back. Or, if you want to have 10 minutes between females, you can do that too. Always keep in mind that all the songs in any category are going to get the same number of spins. If you have a 60's Gold category with 400 songs and the turnover of the category has songs playing 5 times a month, then every song in the category will get 5 spins. The only thing that'll change that is what you might do manually. Like, if on Patsy Cline's birthday, you dropped "Crazy" in five times, then that month it would get 10 spins; the 5 'natural' ones and the 5 you added. One thing about setting rules in clocks is to be careful not to set rules that conflict with the "reality" of the library. Example: if your total active library was, say 25% female and you were formatting 14 songs an hour, if you then were to set a female separation at 30 minutes it wouldn't work. Because 25% of 14 is: 3.5. So that would men your natural rotation and content would have three or four females every hour. That could not happen and ALSO have females separated by 30 minutes. 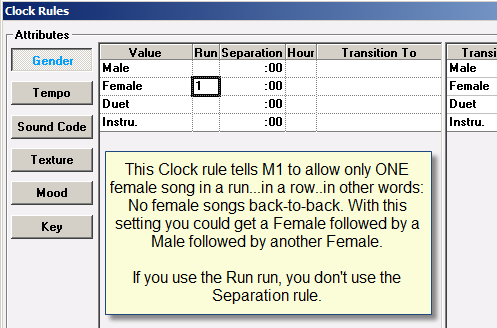 During scheduling, Music 1 would be stop-stop-stopping with Female Separation rule problems.